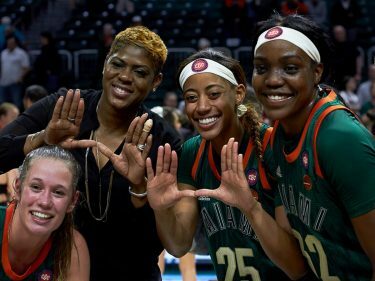 Brown showed exactly what his coach was talking about, pouring in a career-high 30 points – the highest mark for a UM freshman since the Hurricanes joined the ACC in 2004 – to lead Miami to a dominant 77-62 upset victory over No. 9 North Carolina. After trailing 11-2 to start the first half, the Canes (14-6, 4-4 ACC) switched to a zone defense. It made all the difference. The Tar Heels (19-4, 7-2 ACC) struggled to find quality looks on offense and would ultimately get out-rebounded by the Hurricanes, a rare occurrence for the top rebounding team in college basketball. Miami would outscore North Carolina 37-11 the rest of the period and would not relinquish the lead. The swarming UM defense forced UNC to a season-low 62 points. Tar Heels guard Justin Jackson scored 21, but North Carolina as a whole shot just 35 percent from the field. UNC’s Joel Berry II had his worst performance so far in ACC play, missing all eight of his shots and drawing a rare technical foul. Double-double machine Kennedy Meeks was held off the glass largely due to the efforts of redshirt senior forward Kamari Murphy. Last week, the Canes had surrendered a 13-point halftime lead to ultimately fall to the Duke Blue Devils. 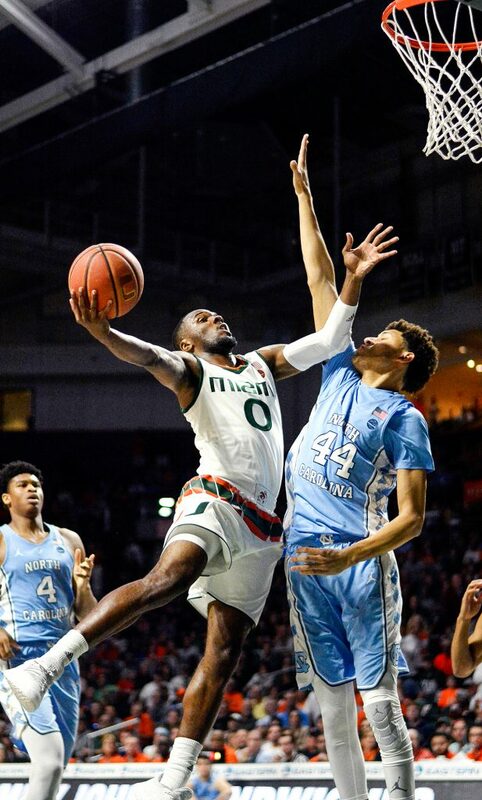 Miami was not going to let that happen again, stretching the second-half advantage against the Tar Heels to as much as 22. Junior guard Ja’Quan Newton, who propelled Miami in the first half with 14 points, was sidelined early in the second period after racking up four fouls. That’s when he let Brown know that the game was in his hands. “I whispered in his ear and said, ‘Take control of the offense,’” Newton said of his conversation with Brown. Brown did just that, consistently driving into the teeth of the North Carolina defense and dishing out passes to set up shot opportunities for teammates. The Canes defense collected 14 steals and blocks combined, and the offense had an 11-0 advantage in fast-break points. Brown hit four three-pointers and 10 free-throws. “I think North Carolina, Duke, FSU, [they]bring out the best in our players because they really want to compete,” Larrañaga said. 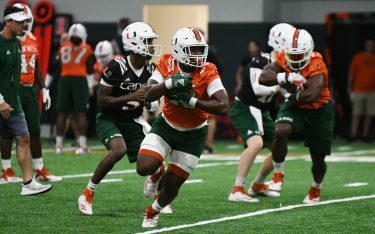 The Hurricanes will try to get back-to-back wins against ranked opponents when the team plays host to the No. 6 Florida State Seminoles at 8 p.m. on Wednesday at the Watsco Center.